Thank You Message For Mom : Mother and child have the sweetest bonding ever. A mother sacrifices many things for her children. But except Mother’s Day how many times you say “Thank You Mom for Everything”? Actually, we all don’t get to say this a lot. But we can bring a smile to our mother and light up her day by giving her a cute thank you note, heartfelt words written on a card or a sweet message. You may send these thank you message for mom which can make her happy and feel proud to have a son or daughter like you. This thank you message for mom indicates that you really appreciate her love and care. It will help you to show your gratitude and replenish the strong bond between a mother and son or mother-daughter relation. Thank you mom. For being the best doctor, best teacher, best designer and the best cook in this world. I can’t thank you enough. I love you mom. Mommy, I tell you everything about my life. I share my thoughts and emotions. But I never tell you one thing. That is Thank you for being my mother. Thank you for your every act. A lot of love. Dear mama, you are the heart of mine. You are the peace of my mind. You are the apple of my eye. And for all of these I want to say, Thank you very much. I am grateful for everything. You have brought me on this earth, raised me and did everything for me. Thank you mom for giving me life. I love you. My lovely mother, thank you for carrying in your womb. Thank you for bringing me to this planet despite suffering huge pain. And thank you for your love, care and help. I know saying thank you isn’t enough at all. Because you did so many things which are not payable. But yet I am saying thank you mother for everything. I am surprised to see that you only want our happiness. You are doing so many sacrifices with a happy face. How can I pay your debt mom? It’s impossible. Thank you for everything. Mom, do you know why the earth is so beautiful? Because mothers are here. I am appreciating all the sacrifices and care of yours. I love you. Mommy, I can’t give you anything big. But I will say one thing. Thank you for being the most beautiful and caring mother. I am really grateful. A daughter’s first best friend is her mother. So you are. And you will always be my best friend. Thank you for your help and advice all the time. Take love from my heart. Sometimes we quarrel and fight as most mothers and daughters do. But I never quarrel you to hurt you. I can’t imagine my life without you. Thank you mom for everything. Mommy, do you know how much special you are in life? I can’t express it. But I feel you every moment in my life. Thank you for being my mother. Mama, I love you so much. You are the stress reliever of my life. You always help me whenever I need. Thank you mama. You are a perfect mom for a daughter. A daughter’s biggest trustworthy person is her mom. She is the teacher of her. And I am really grateful as you are the best mom in this world. My dear mommy you are the best. I am a proud daughter. You are well combined with a funny mother and a serious teacher. Thank you for your care. Mom today I can feel the pain of yours as I am a mommy also. You had so much patient and courage to bring me up. Thank you mom for everything. I am a blessed son. Because I am the son of a good mother who taught me positive things and good manners. Thank you mother for your words. Some people say a son can’t be his mother’s best friend. But we have proved them wrong. You are my best friend. Thank you mom. Today I am a happy and healthy person. And I give all the credit to you mom. Thank you very much for your sacrifices and care mom. I love you. Mom I am feeling great because you are my mother. I am a happy son as my mother is an amazing lady. I love you very much. And thank you. I know you have sacrificed many things for me. You have suffered for me also. 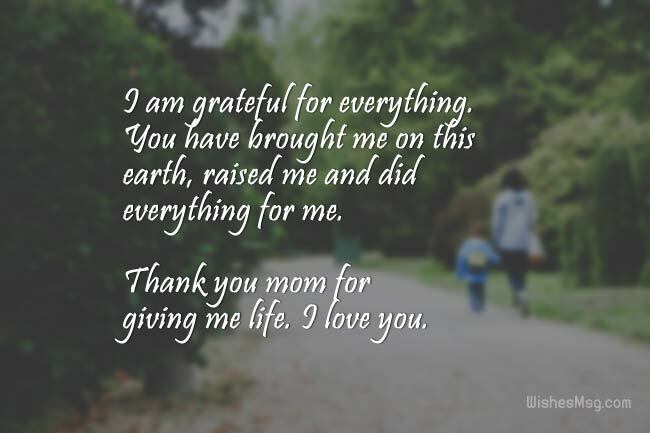 And I am thank you mom for all the things you did for me. When nobody believed me you are the only person who stayed beside me. And today I am successful because of you. Thank you mom for trusting and encouraging me. I love you. I may be a failed son to show you enough gratitude and respect. But from the bottom of my heart, I want to thank you mother. Thank you for everything. Mother, I am trying to be a good son by appreciating your works. I know it seems nothing compared to your sacrifices. But please accept my gratitude. Thank you. These thank you messages for mom are great to appreciate her love and care. But these heartfelt sweet messages can melt your mother’s heart as her heart is the softest in the world. We are thanking all the mothers in the world.